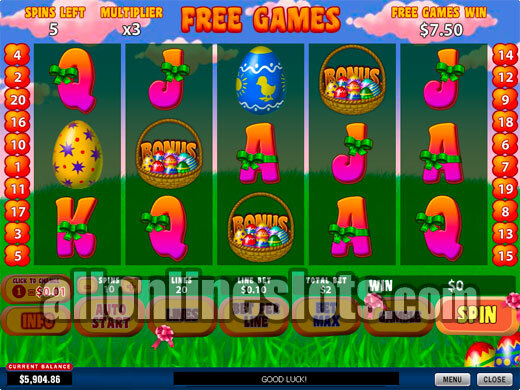 Released in time of Easter 2011, Easter Surprise is a Playtech video slot with 20 lines, a pick a box style bonus, a free spins feature and the option to gamble your wins. Top jackpot is 10,000 coins for five of the wild Rabbit symbols. 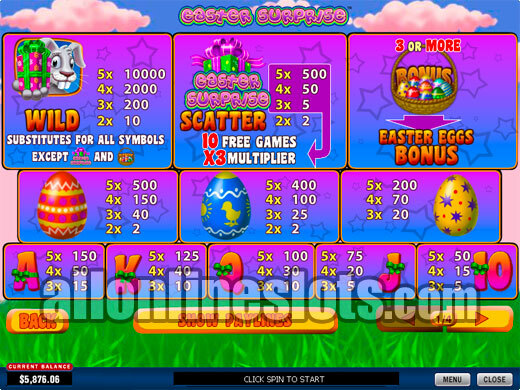 Easter Surprise is a Playtech 20 line slot that was released for Easter 2011 and will be a popular pick during Easter for years to come. The game has two bonus features and gives you the option to gamble your wins with the red or black gamble. 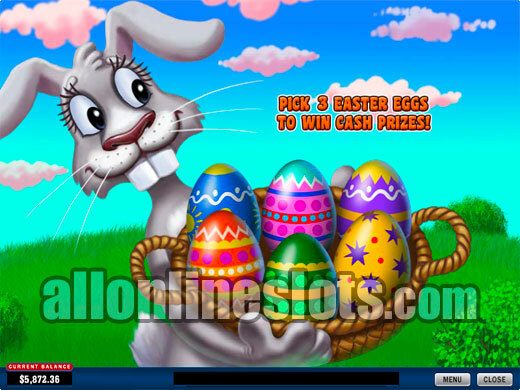 You can play Easter Surprise in a range of coin sizes that start at 0.01. Max bet is 10 coins per line or 200 coins in total so you are looking at betting at least 2.00 per spin if you want to play max bet. You can of course play less than max coins if you want to bet smaller or higher coin sizes if you want to bet bigger. The Rabbit symbol is wild and substitutes for everything but the two bonus symbols. As usual the wilds offer the biggest line wins with five paying 10,000 coins or 100,000 coins if you are playing 10 coins per line. The Rabbits also make up the second highest line win with four paying 2,000 coins or 20,000 at max bet. The line wins take a bit of a dip after the wilds with the three different types of Easter eggs coming in at 500, 400 and 200 coins for five of a kind. The rest of the line wins are made up with the A, K, Q, J and 10 symbols with five of a kind pays coming in at between 150 and 50 coins. All of these wins can be multiplied by your line bet of up to 10. Easter Surprise has two bonus features. The first is a pretty standard free games bonus that is triggered by getting three, four or five of the Easter Surprise scatters. Getting five awards a nice 100,000 coin pay if you are playing max bet. Getting three or more awards 10 free spins with all wins tripled and the feature can be re-triggered. The second bonus on Easter Surprise is the Easter Egg Bonus. This is triggered by getting three or more Egg Basket symbols on an active pay line aligned left to right. You then move to a second screen where you get to select eggs (Preview). Three, four or five triggering symbols award three, four or five picks respectively. This feature hits quite frequently although the potential wins on the bonus seem quite small. 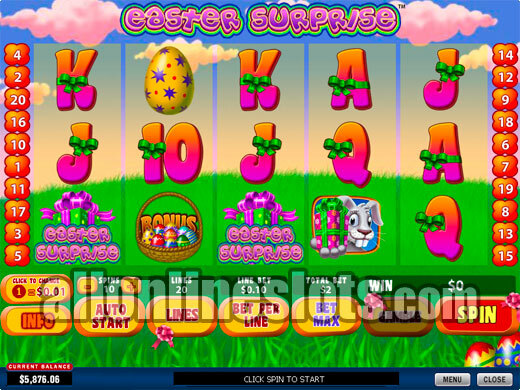 Easter Surprise also has a gamble feature that becomes active at the end of any winning spin. You can then choose to gamble your win on either red or black. You can keep doubling until you collect your win, reach the gamble limit or lose. Overall, Easter Surprise is a good quality game although it doesn't really stand out on any aspect. If you are looking for an Easter them game then its a good choice.